In our previous post, we discussed some new features coming to standard MDI. In today's post we'll get into one of the largest new features coming in vNext, which is the ability to have a full-featured MDI with docked tool window support in a floating container. In the current 2015.1 version, you can float document and tool windows. Each document window goes into its own floating container, while tool windows can be combined in floating containers. Many customers have requested that we allow a full MDI in floating containers and that's what we're bringing to vNext. Let's have a first look at how this will work. Here we have a main window that contains two tabbed documents (docked next to each other) and tool windows in various locations docked around the MDI area. Next I drag the Document1.txt tab into its own floating container. Then I drag Document2.txt and using dock guides, attach it to the first document. This is a new feature that couldn't be done before. 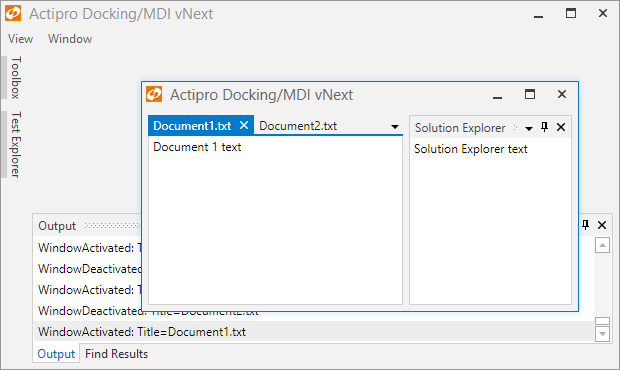 Finally I drag the Solution Explorer and dock it next to the MDI in the floating container. Again, this is a new feature that couldn't be done before. The end result is a single DockSite that has two fully-functional DockHosts in it, one that is primary (within the DockSite) and one that is in a floating container. 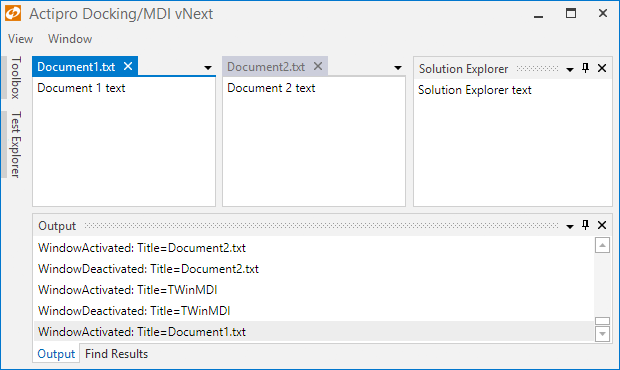 Floating MDI features have been requested by a number of customers and we're very happy to deliver them in vNext. This feature set allows your single app to have multiple MDI areas that can be most effectively used in multiple monitor scenarios. Your end users will love it!